Danville Dental Associates looks forward to participating in the City of Danville’s Festival in the Park each year. The festival is held the third weekend in May, in Ballou Park, on Main Street, in Danville, Virginia. It’s three days filled with craft and food vendors, live music performances, demonstrations, and a children’s area with rides and games. That’s where Danville Dental is, too. Did you know you can paint dental cement? Since 2013, Danville Dental Associates has been bringing an assortment of tiny animals and critters to paint. Did you ever wonder what the tiny paintables were made of? 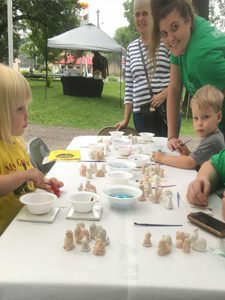 In the months before the festival, Danville Dental Associates staff takes leftover dental cement – used for making impressions – and makes a critter mold to be painted. You might say, it’s a type of recycled art. 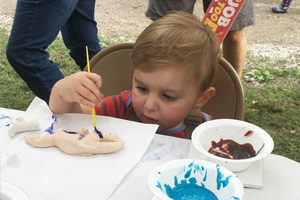 Nothing goes to waste and everyone has a great time painting! The fun is enjoyed by old and young, alike. Some of our artists have been coming every year and have a collection of painted artwork. How cool is that?! Giving back to the community is our joy! Danville Dental Associates loves giving back to our community. Through annual programs such as, Give Thanks for Smiles (held in November), and Smiles for Schools (held in April), Danville Dental has been able to give, in the thousands, to local charities and schools. 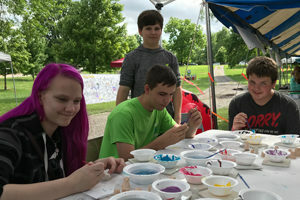 Participating in the Festival in the Park, and the upcoming Children’s Festival, on June 16th, are a few of the many joys we share with our Southside community.